Carol relocated to Olympia Washington for the soul purpose to obtain a position at Shipwreck Beads, as it was her great desire to work in a creative environment surrounded by billions of dazzling beads. Carol Bauer has been with Shipwreck Beads for over 12 years and is currently the store manager, human resources manager and bead ambassador. If you are not familiar with Shipwreck Beads it is the nations largest beading store and it amazes anyone who walks through its doors. The current showroom is over 20,000 square feet and is filled to the ceiling with colorful new ideas. Shipwreck Beads has more than 3,000 styles, sizes and color options just in Seed Beads alone. Shipwreck Beads specializes in Czech Glass as well as beads from around the world. Shipwreck Beads is truly a place of inspiration for all who enter. 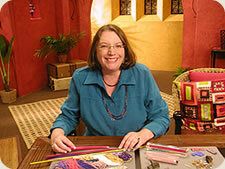 Carol Bauer has had her work published in a number of books and twice was a guest designer for Beads Baubles and Jewels a popular PBS television show. Carol has a degree in Veterinary Science Technology and prior to dedicating herself full time to her beading career 12 years ago worked in the Veterinary Sciences for 18 years.